All Frog Tutoring tutors will meet with assigned students to provide one-on-one private tutoring for subject matters in their areas of expertise. Tutors are to serve as a guide and coach to assist their students to become a successful, independent learner while integrating effective study and learning strategies to maximize the student’s potential for academic progress. Ultimately, it is the tutor’s responsibility to motivate students to want to learn, achieve, and be self-motivated. Why Work For Frog Tutoring? Tutors will choose which grade levels and subjects to tutor. Tutors will create their own work schedule. As long as tutors work the minimum amount of hours a week, they can work as many hours as they like. Driving Compensation Depending on the distance, tutors will be compensated for driving over a certain mileage. Tutor of the month: Every month the Regional Coordinator from each region will submit one tutor to be selected as the tutor of the month. This tutor will have their name and photo posted on the corporate page of the website as well as our Facebook page. Not only will they receive public acknowledgement and a certificate, the tutor of the month will receive “special prize” which will vary each month. During times when there is a high need for tutors, current tutors will receive a bonus for every person referred and hired that are qualified to tutor in high demand subjects. We invite you to participate in VCU’s first-ever Experiential Learning Expo. This event allows you to connect directly with both VCU departments and community-based organizations who offer opportunities for relevant, experiential and applied learning. Whether you are seeking volunteer, internship, research, creative or other experiential opportunities, we are excited to connect you to organizations that can help you grow as a professional. All majors and programs of study are welcome to attend. Wednesday, Nov. 1, 12 p.m. – 3 p.m.
Two upcoming general information sessions are being offered by the National Scholarship Office (NSO). These info sessions will introduce students to a range of (inter)nationally competitive scholarships and fellowships. We will also share with students how the NSO can support them during the application process. A third component of these info sessions focuses on steps that students can take to make themselves more competitive candidates for these awards. These sessions are geared specifically to first- and second-year undergraduates, transfer students, and new graduate students. Tomorrow, Noon – 3 p.m.
from the greater Richmond area. and have a heart for service. Oct. 25, Noon – 3 p.m.
Richmond Tree Stewards will host a free tree care workshop, along with pruning and planting demonstrations and a tree walk, from 9-noon Saturday, Oct. 21, at the Round House, Byrd Park. Doors open at 8:30 a.m. Whether you want to plant a tree, care for ones you already have or just find out how amazing trees are, come to the Tree Stewards’ Community Roots Arbor Day celebration. The speaker will be Janine Lester, who holds credentials as an ISA Certified Arborist Municipal Specialist®, ISA Board Certified Master Arborist® and has ISA Tree Risk Assessment Qualification. Details at http://richmondtreestewards.org/community-roots-arbor-day-celebration/ Registration is requested. A client in WV is having a massive staff up. I have placed 15 chemists with them and need 15 more. New grads are fine. Could also consider Bio or Biochem majors. They need to have up to Organic II plus lab. These folks will start in October. $20/hr jobs with a $10B pharma client. Any VCU grads still out there? I would like to draw your attention to a new PhD program offered at VCU. 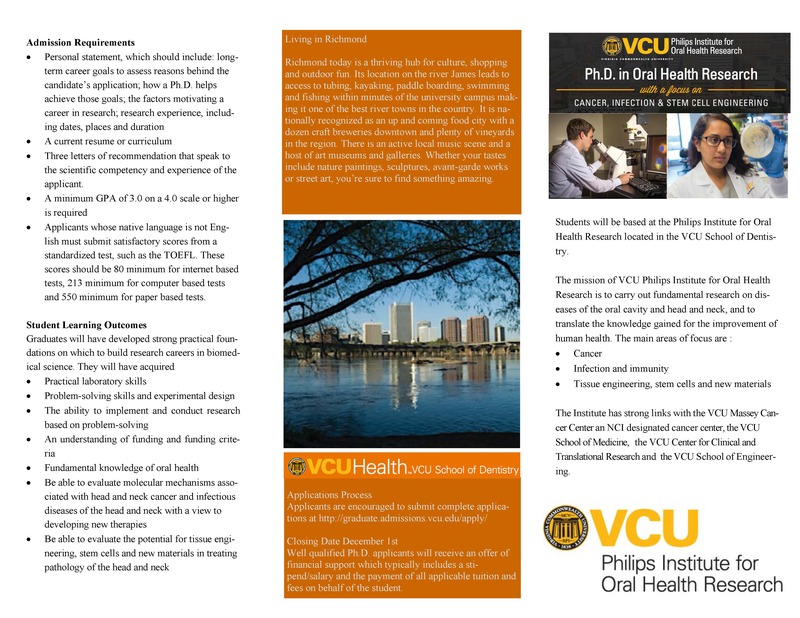 The program is housed in the Philips Institute for Oral Health Research at Virginia Commonwealth University. The Philips Institute is located on the medical campus at Virginia Commonwealth University. We are in close proximity to, and collaborate with the Massey Cancer Center, an NCI designated cancer center, the VCU Medical and Dental Schools and the Institute for Engineering and Medicine. Students will have the opportunity to work with faculty in these centers. Our well-funded faculty of research clinicians and scientists help translate our discoveries to the patient population. We have a small annual intake of students and students receive a stipend and tuition waiver. 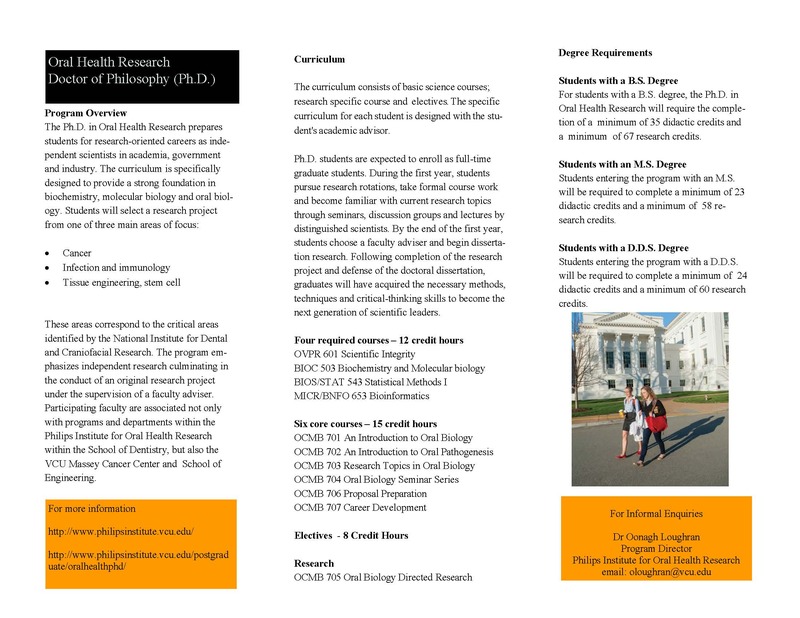 Should you come across any students interested in a graduate degree in biomedical research that you feel may be suited to our program please ask them to contact me at oloughran@vcu.edu. We are currently recruiting a class to enter in Fall 2017.